Forgot to add one more info about Scotland (many more are there to be added actually but this one is important). Kazakhstan is on a -6 hours different zone but Scotland have kept their own time zone regarding preparation for this game. Yeh Scotland have really spared no expense here and clearly have their minds focussed on starting their campaign off with 2 vital wins - they play San Marino at home next. 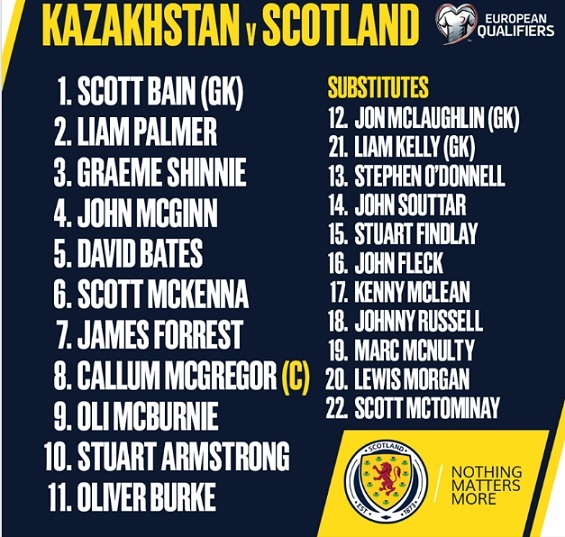 If Scotland weren't without so many of their key players I would consider them a decent bet against Kazakhstan. Both sides are missing key defensive players which could lead to cards and/or goals you'd think. The absence of Fraser is unfortunate as he does a great job pressing from the front for Scotland. I also watched Kazakhstan's friendly with Moldova which was Bilek's first game in charge and they looked to be well drilled and organised, passing the ball around quite nicely. Bilek has talked in his press conference about the danger of Scotland's fast players so I expect Kazakhstan will be very selective when they choose to press and when they fall back. All that being said I think Scotland might just have enough quality to nick this one but a no bet. Looks pretty offensive that, with plenty of goal threats in the side. Scotland players definitely love space to run into as seen in their thumping of Albania who were constantly undone by trying to set a high line. As I mentioned in my post though I'm a bit concerned Belik will play more conservatively and not give them that space. Maybe one for in-play. Sidenote, stopping Willain this season has been very easy, he's been just awful this season for me. He can't even execute a FK, his greatest weapon. Nice info this one cause i should add here that Celtic's McGregor has been named captain for this game by coach McLeish.. He is in general a calm guy so maybe at the first minutes we will see a game between two teams that will ''measure'' each other and that's why he was picked as captain. Cause McGregor is playing for the National team only 18 months now. Also to add that McGregor is one of the three players who have experience of Astana Arena stadium as they played there with Celtic. Poland are shaky in defense, they're fragile while defending set-pieces. Their best central Glik (Monaco) is not on his peak form, other defencemen are not rock solid, either. Austria perhaps don't impress in attack but are still dangerous.They play at home, start new life in new campaign. I see them score at least one goal tonight. Where Poland do have quality is offence. Lewandowski, Milik, Piatek (sub) may threaten up front, feeding by Grosicki and Zielinski. Austria will be pushed forward by home supporters so Poland will have their chances on the break. Albania are too underestimated in my opinion related to Turkey and Iceland in this group. There is also great value in backing Albania to finish top two in their group at a current average price of 15.0. Although their current form is not the same as four years ago when they qualified for Euro 2016, they are still a solid team. France will comfortably take the top spot in the group, leaving Albania, Turkey and the aforementioned Iceland to compete for the second place. There is a downward trend in the Icelanders' performances and the virtually secure playoff spot they have. This may influence them and it won't be surprising to see them out of the top two in November. Turkey, on the other hand, are in some kind of a transition period. They are nowhere near the level they were showing in the previous decade when they played in European and World Cup semifinals. Their performances in the Nations League were not convincing and, as a result, they were relegated to Division C.
According to the bookmakers, Turkey and Iceland are with identical chances to finish in the top two at 1.80 each, leaving Albania a distant underdog in this race. Despite that, the first match this week sees Albania host Turkey. They have a chance to clinch a positive result from that game, after which they play away to Andorra, and at the same time Iceland are away to France. This provides a good opportunity to the Albanians to gain a 3-point and psychological advantage over their rivals after the second round of fixtures. Even if you don't believe they will make it, you could cash out your bet after Matchday 2 if things fall into place and your online bookmaker allows that. A price of 15.0 is just too good to pass on here in my opinion. Last edited by Vocelov; 22-03-19, 13:42. Iceland have gone a full year without a win, having played 15 games in the process (6 draws and 9 defeats). They are really struggling and will be expected to turn their fortunes against one of the football ?minnows? in Europe. However, Andorra aren?t taking it easy at home lately, drawing all their three home games in the Nations League. In the last World Cup qualifying cycle they even managed to beat Hungary. Hence, it?s highly likely that if Iceland fail to score early in the game, they may feel the pressure of needing to win at all costs which can backfire. In addition, bookmakers expect a low-scoring game. I?ll proceed with a wager onAndorra (+2) Handicap Result at odds of 2.00 (Evens), meaning Andorra mustn't lose the game with more than one goal. Turkey are certainly not at the level of the past but I would still consider them worthy favourites against Albania. Turkey still produce some quality players and recently were able to pull off a somewhat fortunate yet impressive fight back away to Sweden in the nations league. Besides if Scotland can destroy Albania with such ease - yes assisted by the red card - and Scotland are hardly a top team in Europe, then I believe Turkey have enough quality to win away to Albania. I'm not sure a draw is something that either team will be playing for given France are nailed on for top spot and that leaves 3 teams for 1 spot, meaning home wins will be absolutely crucial. Personally feel there is more value for you in Albania to win. But again, I think Turkey win this one. Like both your other bets though Vocelov. Welcome and good luck. Last edited by latortuga; 22-03-19, 15:54. I think Turkey win this one. Thank you : ) Yes, I am least confident in the Albania bets, hence the small stakes on them. Let's see what happens, it's a Balkans derby and sparks will fly. Disasterous first half cost a match for Latvia. Midfield is the worst part for the team. Bookies offer -2.5 as 50/50 in tomorrows game against Poland. -1.5 for sure, but IDK how bus will work against Poland. Coach has met all players and saw what they are capable for. After game against North Macedonia he said, that players have no phisycal skill at all, as the season has just started in Latvia. He was angry. Latvia to score @3.00 is worth a try. There were some good chances to score more against North Macedonia. Hungary are far from their 2016 form. They have been struggling since then that made the Hungarian FA change the coach two times already. Loads of money have been spent on football establishing academies and building new stadiums but still no fruits to enjoy. Since the Euro 2016 they lost at home against top teams like Switzerland, Portugal (WC group games), B teams like Sweden, Russia, and others like Australia, Kazakhstan, Scotland (prep games). On Thursday they lost against Slovakia 2:0. After the game the captain Szalai complained about the lack of tactical skills of his teammates and both the defending and attacking phases. I do not expect them to improve too much in just three days. On the other side we have Croatia, fresh WC finalists. They have better quality players in each part of the field and they are as competitive as all the teams from the Balkan no matter what sport. Their last losses are against teams like England and Spain since the WC-final. They started the campaign of Euro 2020 well winning against Azerbaijan at home (2-1). Their H2H is interesting (3 draws) but not relevant, as the last meeting was a prep game from 2016 ending 1-1, but that Hungarian team were at the upside of an arc. I believe that the Croatians can easily beat this Hungarian team and the odds for that are quite generous. The more adventurous can try AH-1. GL! After annihilating Scotland 3:0 a few days ago, the Kazakhs? confidence will be sky-high. It's a rare occasion for the home crowd to see a victory in a competitive match. They will try to carry the momentum into their second game and take advantage of the fixture list which enabled them to start with two straight home games. However, their last two matches against Russia finished with 0:3 losses. After reaching the quarterfinals of the World Cup playing at home, Russia have been on a downward trend. They couldn't win their Nations League group, and they lost their first qualifier away to the absolute favorite Belgium on Thursday. They have to bounce back today and are indeed the better team, but I'll back the draw with minimum stake at average odds of 3.40 due to Kazakhstan's performance against Scotland. Another draw with minimum stake can be attempted as a bet on Hungary v Croatia. Hungary have two faces - terrible away and almost flawless at home. They've won 6 of the last 7 competitive games at their stadium. After losing their match from Matchday 1 away to Slovakia, their back is against the wall to perform today. Croatia, on their behalf, don't look like the same team who won silver medals at the World Cup. They barely managed to beat Azerbaijan at home on Thursday, and today's game is, at least on paper, much harder. Good news for the Croats is the return in the squad of key team members such as Rebic, Brozovic and Lovren. Their expected problems are at the back - 4 of the 5 players at the back (goalkeeper + defense) who were heroes in Russia last year, won't be able to play. This was hinted at on Thursday when Azerbaijan scored a goal that was definitely avoidable by more careful defending. At least the goal was beautiful. The draw is priced at 3.75 and in my opinion a small stake on that pick is worth it. Slovenia are priced at 1.85 to take care of North Macedonia at home. The Slovenians won a point away to Israel, which isn't perfect for them but also isn't terrible. Backing that draw up with three points at home tonight is vital. They have more quality than their recent results show. Slovenia couldn't get a single win in six games in the Nations League, getting relegated to the last Division D. However, all of their losses were with one goal difference. After they started with 0 points from 3 games, they made a coaching change which improved their performances marginally. Their last 4 games have finished in 1:1 draws. Today's the perfect opportunity for them to finally win. North Macedonia are in a good period and won their Nations League group, securing at least a playoff spot for EURO 2020. However, the quality of their opponents in Division D was weak and can't be compared to the higher divisions. They lost 4:0 away to Armenia (who lost 0:1 at the same stadium to Gibraltar). North Macedonia are much better in front of their own fans than away. The recent H2H record favors the Macedonians, but all streaks come to an end. Slovenia know that they are in the easiest EURO 2020 Qualifiers group and that if they don't win today, it will most probably cost them their chances to qualify. I am on a home win on average odds of 1.85 with 5/5 confidence. A football classic is also on today's schedule - Netherlands host Germany. The same fixtures was a part of the Nations League several months ago, and The Oranje were comfortable 3:0 winners. I am backing them again tonight. Both teams are in a restructuring process, but at the two different spectrums of that process. Netherlands missed the last two major international tournaments and made big changes to their squad. After more than half a decade of mediocre performances and results, they finally resemble the formidable force they have always been in European football history, reaching the final stages of World Cups and European Championships regularly. Germany, on the other hand, are at the very beginning of their restructuring after the terrible 2018 they had. After getting knocked out in the group stage as defending champions at the World Cup, they also finished last in the Nations League group, getting relegated to Division B. The coach and the players are highly criticized from the local press and fans. Three remarkable players from their successful 2014 World Cup campaign were removed from the squad Jeromeme Boateng, Mats Hummels and Thomas Muller. Fresh young faces constitute the German team now, but they need time to gel. That was evident on Wednesday in the draw with Serbia in a friendly match. An away game at the Netherlands is not the best game to go next to. Home win with 3/5 units on average odds of 2.40 seem like a reasonable bet. Last edited by Vocelov; 24-03-19, 15:33.